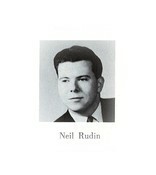 From the Jewish News of 11/10/11 DR. NEIL HERBERT RUDIN, born and raised in Detroit, lost his courageous battle against ALS on Nov. 1, 2011. A Fulbright Scholar and Wayne State graduate, Dr. Rudin was a professor and dean at SUNY Buffalo State, publishing dozens of papers on topics including German, Yiddish and American Jewish literature. He gave addresses throughout the U.S., Canada, Europeand Asia, and was a leading advocate for college freshmen. After retiring, Dr. Rudin conducted genealogical research, published his memoirs (Growing Into My Genes), and founded the Rudin Family Giggle Fund for children in hospice. He was devoted to family, a storyteller with a great sense of humor and committed to living a life filled with honesty, compassion and laughter. Dr. Rudin leaves behind his loving wife Cheryl (nee Horowitz); his son, Joel (Debra); daughter, Marla (Michael); four grandchildren. Contributions may be made to the Rudin Family Giggle Fund, Tidewell Hospice (Sarasota) or ALS/TDI.